Oh, eggs. There are just endless possibilities with you. Endless, delicious, possibilities. And today’s recipe is extra awesome because it means you have breakfast allllll week. Yes! Preheat oven to 350 degrees. Grease a 12-cup muffin tin. 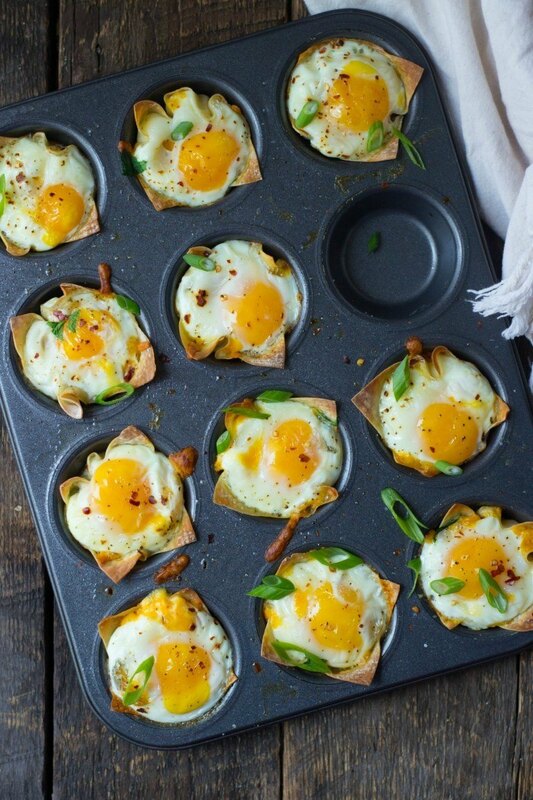 Tuck wonton wrappers into each muffin cup. Coat with cooking spray or brush with oil/butter. Bake 5-6 minutes, until just starting to brown. Remove from the oven. Distribute spinach, sausage, cheese and an egg in each wonton cup. Season each with salt, black pepper and crushed red pepper flakes. Bake 18-19 minutes, until egg is just set. Garnish with sliced scallions.